Riding the Shinkansen in Japan is always a fun experience. Not only does it go super-fast (you can totally feel those G-forces! ), it’s also guaranteed to be quiet and incredibly clean. But with 323 Shinkansen trains departing from Tokyo every day, how do they find the time to clean all those trains? Well, it turns out that it takes a highly synchronised team of mega-efficient cleaners only seven minutes to clean each train – since that’s all the time they have!. And here’s an incredible video of how they do it! 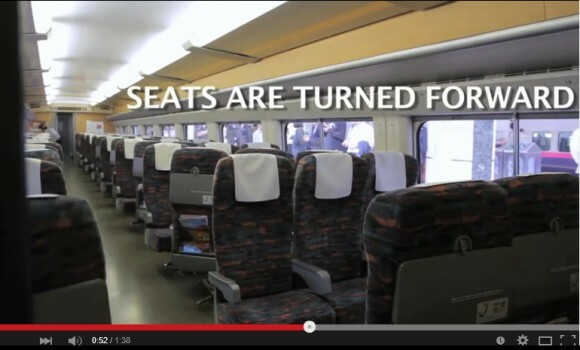 The video, titled “7-Minute Miracle”, explains exactly what steps are involved in cleaning a Shinkansen train from nose to tail in the seven minutes between the train’s arrival at the station and its next departure. Cleaning teams are in position on the platform as the train pulls in so as not to waste a second, and, as you can see, no corners are cut as they clear and wipe down each car with incredible speed and efficiency. Our favourite part was when they flipped all of the seats around (there’s a SECRET button!) so they’d be facing in the right direction for the next journey. Oh, Japanese design! No, we were kidding. Our favourite part was when they lined up at the end to bow to the waiting passengers. Now that’s what you call style! Next time you’re in Japan and taking a ride on the Shink, spare a thought for the hard-working cleanup crew!